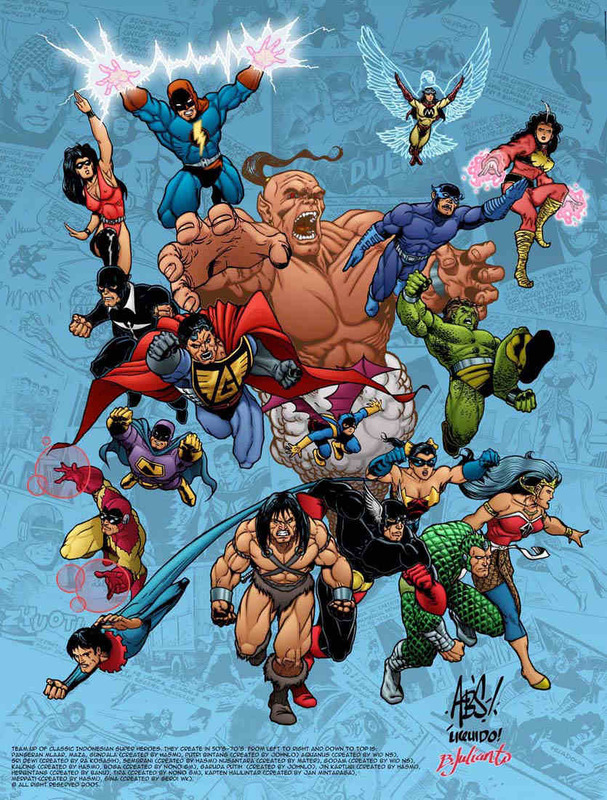 A team-up of classic Indonesian superheroes created between the 1950s and '70s. From left to right and bottom to top is Pangeran Mlaar [Prince Elongated], Maza, Gundala [Lightning] (created by Hasmi), Putri Bintang [Princess Star] (created by Johnlo), Aquanus (created by Wid NS), Sri Dewi (created by RA Kosasih), Sembrani [Magnet] (created by Hasmi), Nusantara (created by Mater), Godam [Hammer] (created by Wid NS), Kalong [Flying Fox] (created by Hasmi), Boga (created by Nono GM), Garuda Putih [White Garuda] (created by Johnlo), Jin Kartubi [Kartubi The Genie] (created by Hasmi), Herbintang (created by Banu), Tira (created by Nono GM), Kapten Halilintar [Captain Thunder] (created by Jan Mintaraga), Merpati [The Dove] (created by Hasmi), Gina (created by Gerdi WK). Penciled by Aan Budi Sulistyo, colored by Berny Julianto (who also kindly supplied the image and information on many of the characters featured on this section of the site). All rights reserved.